We are excited to bring you some big new LibGuides features by the end of this week, just in time for Spring (or Fall, depending on where you are! ), including the ability to put your entire site behind your Single Sign-On system with LibAuth authentication, search-and-replace for E-Reserves Items, and a bevy of other fixes. Coming this week is the ability to place more public LibGuides pages behind your SSO with LibAuth, whether it’s a single guide, a restricted group of guides (LibGuides CMS only) or your entiresite. We’ve got you covered whether you are required to hide your entire site from the open web, would like to provide access to a group of guides to your campus, or make a single guide available just to one constituent group. We’ve written a lot lately about site security, and this post is no exception. Coming this week is automation for the installation of Let’s Encrypt certificates for LibCal and LibAnswers sites. Need a secure site but can’t really shell out for a custom security certificate? We got you! Just change your custom domain’s DNS to point to the correct secure endpoint, and we’ll do the rest. For more in depth information about Let’s Encrypt, read this blog post. We’ve updated the Assets page with new filters so that you can search your growing repository with ease! Search not only by type, but owner, subject, URL, and even for code contained in your Media/Widget content. Want to know how many YouTube widgets you have? No problem! Want to see the vast array of Animal Husbandry resources you have? A cinch! Just go to Content > Assets and search to your heart’s content. Are you one of those folks that used the rotating box code to show off a selection of your guide owners in LibGuides v1? Well now you can do that in LibGuides v2! 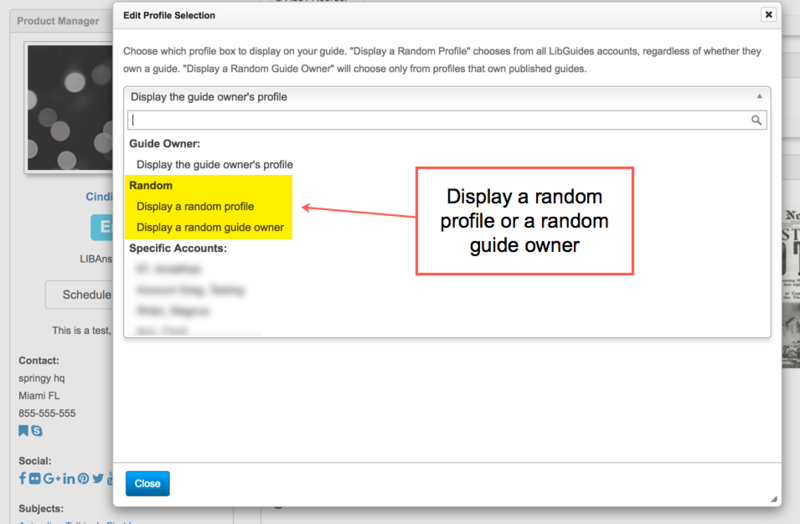 After adding a profile box to your guide, you can set it to display a random profile each time the page is loaded. You’ll see two options: one will display a random profile selected from all profiles in your system, Admins, Regular, Editors, and Contributors; the other will choose only from profiles that own published guides. We have added E-Reserves items to the Search & Replace tool. If you’ve discovered that a title was recorded incorrectly and you’ve re-used the item in every. single. English. course. for the semester, you can save a slew of clicks by using S&R. 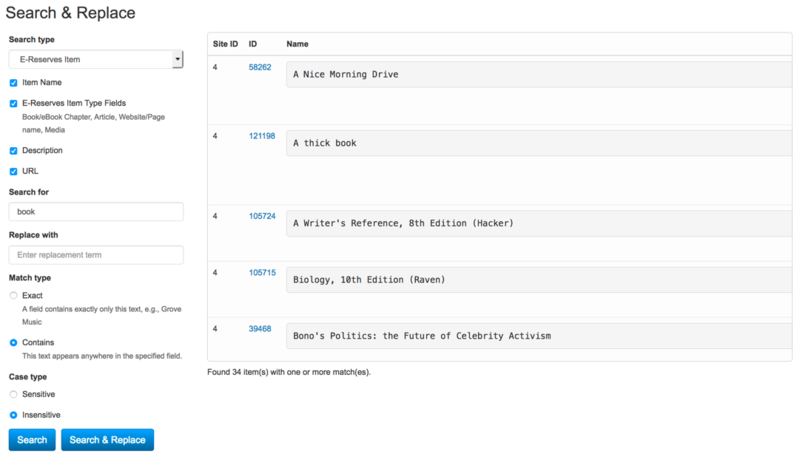 It works like the other S&R tools: you can search for E-Reserve item name, description, URL, and the fields that are particular to the various E-Reserves Item types, like Article Title and DOI. Head over to Tools > Search & Replace to get started. We are also including a bunch of smaller features and fixes that we’re sure you’ll love! Gallery boxes added as custom boxes to E-Reserves course pages display properly. If you uncheck “use this image in my guide” while uploading a new image to Image Manager, the Upload New Image button persists after upload. The mSite builder “site visited” cookie is now 2 minutes instead of 2 hours. We fixed the ability to add an IP restriction from inside a guide as well as from Group settings. We added missing content types to the Add Content Item dialog on the Content > Assets page. Editor account levels are now able to delete rich text content items on guides they edit. In Tools > Data Exports > XML, the Download icon is not available until the file is ready to be downloaded. Links to guides submitted via publishing workflow are no longer relative. An error in the search sources was fixed, allowing EBSCO Discovery Service contents to be retrieved. We removed the outdated “scheme” attribute from meta tags. We changed the way that guide titles sort, so that whole and decimal numbers are sorted properly. We added the URL to the export for non-database assets. We changed the text for the unsubscribe links in blog post emails to be more accessible.